“I have lived on my own for 12 years, and in order for me to continue living on my own, I have to keep my upper body strength up,” she explained. But there’s more to the YMCA for her than just a means of maintaining her strength and her health. It’s also a place for her to be herself. After hearing Audrey’s story, Dreamscape Foundation is working with the Missouri-based YMCA and Audrey in order to raise funds for her to receive 12 one-on-one sessions from a personal trainer who can create a custom workout routine to help Audrey reach her physical goals. 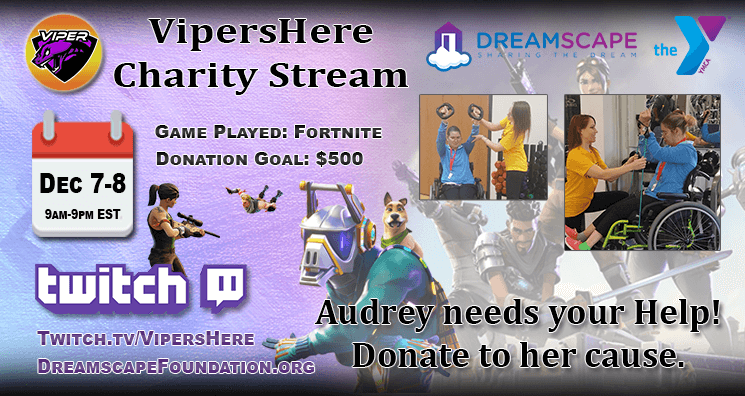 To reach her financial goal, we’re collaborating with Twitch streamer Vipershere for a 2-day charity stream December 7 and 8 to raise funds toward this goal. During this event, he will be playing Epic Games’ globally popular online game, Fortnite. One hundred percent of all donations given to this campaign will go directly toward the purchase of a 12-pack of individual training sessions for Audrey, which she can redeem at her local YMCA.